On October 16, NASA scientists found a number of large icebergs between Antarctica's Larsen C ice shelf and the A-68 ice island, which separated from the ice shelf past year. The world recently got a look at a gloriously sharp-cornered "tabular iceberg" in a photo snapped by NASA scientist Jeremy Harbeck. Operation IceBridge is an ongoing NASA mission to monitor changes in polar ice. Previously, NASA has launched a project to search for extraterrestrial civilizations. "We get two types of icebergs: We get the type that everyone can envision in their head that sank the Titanic, and they look like prisms or triangles at the surface and you know they have a insane subsurface", Brunt told Live Science. NASA started this year's Operation IceBridge in October and some of the images show not just the majesty of southern polar ice, but also some of the rather odd and weird shapes that icebergs can take. That image also captures A68 in the distance. The new image comes just days after a photo of a perfectly rectangular iceberg found in the northern Antarctic Peninsula was widely shared online. 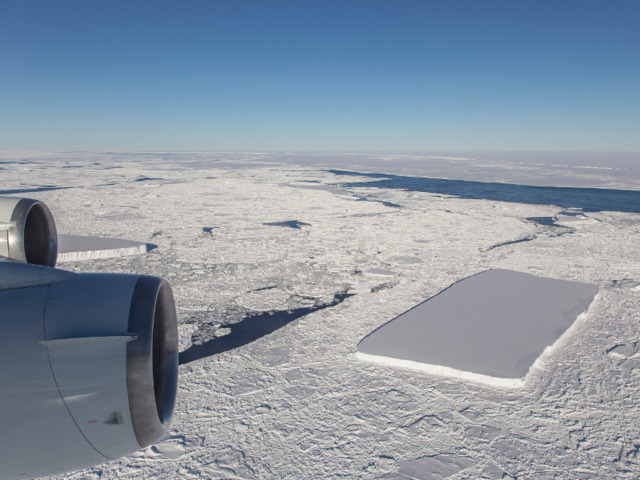 According to NASA officials, the rectangular icebergs appeared to be "freshly calved" from Larsen C, which the parted ways from the iceberg now known as A-68 parted in July 2017. As per a statement by Harbeck, he said that at first he thought it was pretty interesting and he often sees the icebergs with the relatively straight edges. The exploration is a part of a five-week long deployment which is scheduled to be concluded on November 18. Taken during an October 16 research flight over the northern Antarctica Peninsula, the picture recently went viral. NASA calls the captured design "a tabular iceberg, a type of iceberg both broad and flat", USA Today reports. But in the released picture of that, it has shown only a portion of that iceberg. The team from the Papahanaumokuakea Marine National Monument is expected to survey the effects of the hurricane later in the week. Before East Island was erased from the map, it was a critical habitat for endangered Hawaiian monk seals and green sea turtles .